The next generation of security monitoring is here. 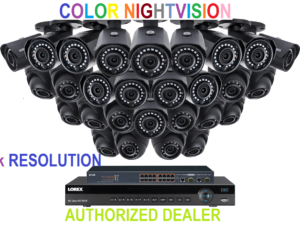 The web exclusive 2KHDIP844D features our 4K capable 8-channel NR900 network video recorder (NVR) and comes with eight 4 megapixel (2K) weatherproof IP cameras featuring outstanding color night vision capabilities. Leave nothing to the imagination with 2K security monitoring. The LNB4221 bullet camera and the LNE4422 dome camera are both capable of capturing video at a 2K (4 megapixel) resolution. This quality can be the difference you need when identifying important details such as facial features or license plate digits. Both cameras also utilize wide angle 90° lenses to provide you with expansive fields of view from every camera. 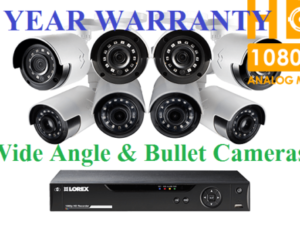 1080p security cameras use a 1920 × 1080 pixel ratio. That is a total of 2,073,600 pixels. 2K security cameras, other the hand, use a pixel ratio of 2688 × 1520, totaling 4,085,760 active pixels. That is double the resolution of 1080p. This higher resolution will provide you with more details and clarity, not to mention an increased ability to zoom in on distant objects without drastically reducing image quality. You can record 2K footage at 20 frames per second (FPS) or record at a real-time 30 FPS in 1080p HD. If your camera needs to be in a high traffic area, you may want to opt for 30 FPS. This will deliver the smoothest on-screen movement and can help capture the precise moment you need for evidence. This is simply because there are more frames available to choose from. HDR (High Dynamic Range) is a technology that works to ensure that you capture the most important details. It uses the difference between the darkest and lightest areas of the video to automatically adjust the picture’s brightness. 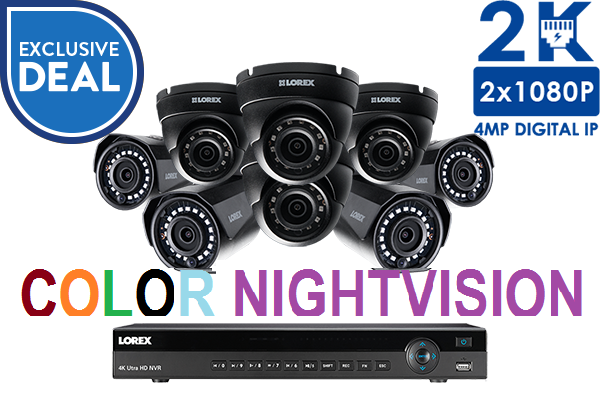 This results in optimized, highly-detailed security video in all lighting conditions. DNR (Digital Noise Reduction) technology is used by your security cameras to filter out noise (grain) from low-light settings, as well as any noise caused by motion. This provides you with a cleaner, more accurate image with better clarity, sharpness, and improved motion detection. It will also help reduce video file sizes as well, which will save you storage space on your NVR. 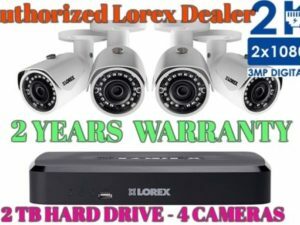 As a Do-It-Yourself security camera company, Lorex is proud to provide customers with security systems that feature easy-to-install set-ups. The 2KHDIP844D web exclusive bundle is no exception. Your 2K security system will be up and running in minutes with its straightforward plug-and-play structure. Each IP camera needs only a single cable run to connect to your NVR camera thanks to Power-over-Ethernet technology. This all-in-one cable provides both power and video transmission up to 300ft / 91m (click here to purchase extension cables). A digital IP system like this can also incorporate a PoE switch. This switch can extend and minimize the amount of cabling required for larger properties. Have your security system at your fingertips by downloading the free FLIR Secure™ app for your mobile device or personal computer. Securely access your system no matter where you are in the world and see what your cameras see (or watch recorded playback) all from the palm of your hand. In-app features such as motion activated push notifications, group mode, cloud storage and the brand new privacy mode that allows you to turn off the recording of a camera make this app an extremely powerful tool. Versatile wall or ceiling installation options allow you to place your cameras wherever you need them most – indoors and outdoors. IP66 rated, the LNB4421 and LNE4422 2K security cameras are able to continue working through heavy rainfalls and blistering snowstorms. Their heavy-duty (yet durable) metal housings and vandal-resistant designs add further protection for safe outdoor application. Both sets of cameras in this system are built with a solid metal housing that protects them from both violent impacts and harsh weather. Engineered from the same material that is used in the construction of airplanes and cars, you can be confident that this corrosion-resistant aluminum body will persevere through rain, snow, and even hail for years and years. The 2TB security certified hard drive within the NR900 can safely store weeks (or even months) of recorded security footage. Engineered for the constant workload required by security monitoring, this HDD can continue to record even while you watch recorded footage. Your bullet and dome security cameras both come with cutting-edge HEVC (otherwise known as H.265) video compression capabilities. With this compression, you will receive significantly better video quality with similar file sizes as H.264. This means that HEVC will keep the 2K video quality, but not the 2K file size. HEVC compression will also let you see the highest quality security footage on your smartphone or tablet without large data transfers. Customize each camera to record security footage continuously, during scheduled times, or when movement is detected. 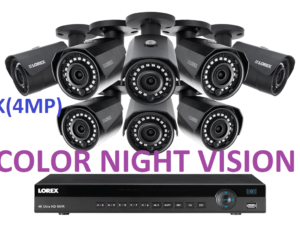 This means that you can program higher activity cameras to record all of the time while lower activity cameras can be set up to record only on motion events or during the night. Scheduled and motion options can save you plenty of hard drive space and allow to keep older footage for longer time periods. Motion recordings also include a pre-recording function that will go back to record the five seconds before activity is detected, ensuring that you will never miss those first few vital moments of movement. You will receive free automatic firmware updates to your NVR as long as it is connected to the internet. These updates and security patches will make sure that your NVR is always up-to-date and protected from any new vulnerabilities. 2K resolution offers twice the resolution of 1080p with approximately 2000 horizontal pixels. This new level of details will vividly improve the video quality of your security footage.